Native to the Mediterranean climate of the Middle East, almonds (alternatively known as Prunus amygdalus or Prunus dulcis) have been under the spotlight for some years now. These nut-fruit are extremely famous for their amazing health benefits, being, without a doubt, fantastic additions to a healthy and balanced diet. Almonds can still be found in the wild, although it is best to consume only domesticated varieties because wild almonds are not only very bitter, but also poisonous. Basically, wild seeds have a substance called amydgalin which turns into prussic acid (or cyanide). If ingested, prussic acid is deadly to any living being. Moreover, another reason to only eat almonds from domesticated species and avoid those that grow freely in the wild is because the ones from domesticated trees are subjected to strict controls that prevent the commercialization of almonds contaminated with aflatoxins, a type of toxin with carcinogenic effects. Regular almonds are especially cultivated for safe consumption and an excellent source of nutrients, as you will see further on in the article. First of all, almonds are a source of Omega-3 and Omega-6 fatty acids, essential compounds that our body requires in order to function properly, but cannot produce on its own. Both Omega-3 and Omega-6 fatty acids are essential super-nutrients known to efficiently reduce cholesterol levels and, according to numerous scientific studies, significantly lower mortality rates in people suffering from heart disease. Nutritionists wholeheartedly recommend including essential fatty acids in our diet and raw seeds and nuts such as almonds are by a far a healthy choice for our arteries! 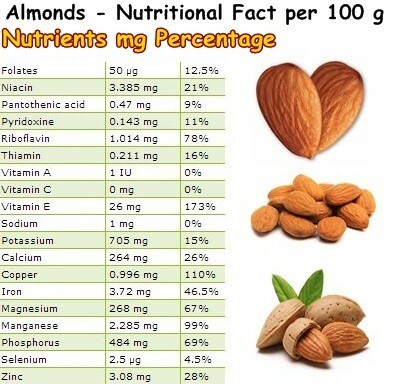 Another reason why almonds are especially healthy is their antioxidant content. Ellagic acid and gallic acid are two extremely potent phytochemicals generously found in almonds, with strong antioxidant effects. Studies show that consuming foods rich in ellagic and gallic acid offers great protection against numerous forms of cancer. Also, ellagic acid is known to induce apoptosis or cell death in existent cancer cells in laboratory tests which is why it is currently under intense study in hope of turning it into an efficient anticancer treatment. Vitamin E is another potent antioxidant substance found in almonds. A little over 100 g of fresh almonds provides you with two times the daily allowance your body requires. As you may already know, vitamin E is the secret to getting a gorgeous skin, helping skin cells retain moisture for better hydration. More important, vitamin E acts as a potent antioxidant because it limits the production of free radicals in our body and thus protects us from developing serious chronic diseases related to free radicals. This means that almonds are the secret to both beauty and good health. In addition to this, almonds are a wonderful source of B-group vitamins. Riboflavin, niacin, folate, thiamine, pantothenic acid and pyridoxine all maintain healthy energy levels by supporting the metabolism of carbohydrates, fats and proteins. Moreover, almonds are especially rich in minerals such as copper, manganese, magnesium, potassium, phosphorus, iron and zinc. Copper is essential for a normal growth, helps store iron and strengthen bones, supports the activity of the thyroid gland, has antioxidant effects, strong healing and antimicrobial properties. If you take a look at the nutritional table above, you will see that 100 g of fresh almonds can provide you with all the copper your body needs which means you can enjoy all these wonderful health benefits it brings. Magnesium supports the action of both calcium and potassium which means it is the prerequisite for strong, healthy bones and healthy muscles, heart included! Last but not least, zinc is essential for a strong immune system. Also, almonds contain rich amounts of dietary fiber which not only protects the colon from overexposure to waste, but is also very efficient if you plan on losing weight. I find almonds extremely helpful for preventing and relieving constipation and one of the best foods for hemorrhoids. The fiber found in almonds as well as other potent natural compounds (plant sterols, to be exact) efficiently lower cholesterol levels, making almonds incredibly healthy for our cardiovascular system. However, it is best to pay attention when eating almonds for the first time because they can be allergenic or you may find your body isn’t really agreeing with them. If you do not exhibit any allergy symptoms, then you are incredibly lucky because almonds are one of the healthiest foods on the planet and the best part is they are easily accessible in many countries worldwide. I mean, what more could you ask of a nut? In addition to being extremely rich in vitamins and minerals, they have incredible antioxidant properties and can provide a wide range of potent nutrients with great health benefits such as Omega-3 and Omega-6 essential fatty acids. The oil obtained from almonds is a wonderful emollient and is used in aromatherapy, as well as in cosmetic products and pharmaceuticals. Almond flour is a great substitute for anyone suffering from celiac disease or wheat sensitivity. All in all, almonds have amazing properties and health benefits, which is why they are wholeheartedly recommended as part of a healthy, balanced diet. However, there is still the concern about the presence of aflatoxins in almonds. Aflatoxins are toxins produced by several pathogenic fungus strains, namely Aspergillus flavus, but also Aspergillus parasiticus, Aspergillus niger and Aspergillus monius. Aflatoxins are pathogenic to both humans and domestic animals and can contaminate a variety of foods, from nuts to staples such as corn and other crop seed, but also milk and dairy products. There are six types of aflatoxins: B1, B2, G1, G2, M1, M2, the last two occurring in milk and its byproducts. Of the 6 types, aflatoxin B1 is a known carcinogen, with research linking it to liver cancer occurrence. However, G1 and M1 are also potential cancer-causing agents. Aflatoxins have been found to be present in most nut varieties, almonds included, and develop in the presence of moisture that feeds the growth of the fungus. Most developed countries have very strict regulations meant to control the level of aflatoxins in nuts and other foods. Thanks to such controls, the content of aflatoxins in almonds is strictly regulated and contaminated batches are prevented from reaching the market and consumers. Nevertheless, it is still possibile for trace amounts of this toxin to be present in almonds, despite processing efforts to remove it. While such small amounts do not pose any immediate health risk to consumers, the long term health effects of exposure to trace amounts of aflatoxins are currently unknown. According to official reports, chopped almonds are believed to pose the highest risk of contamination, while almond flour is said to be the safest due to the processing methods it is obtained through. Now there is. Your intervention is greatly appreciated. If there is anything else you would like to see discussed on the blog, please do not hesitate to bring your ideas and requests forward.